Well, I needn’t have worried. 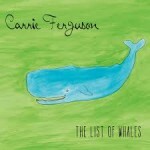 Right from the first measures, Ferguson’s second album, The List of Whales, just reaches right in and commands the listener to move and be moved. The upbeat fiddle-infused opening track, “Sunlight,” masks its story of a bittersweet journey of self discovery and seeking under a foot-tapping beat: “I’ve chosen things I thought were great that tore my soul apart/Sometimes it takes a few mistakes to know your own heart”. Ferguson’s voice is solid; she knows her range and uses it well. 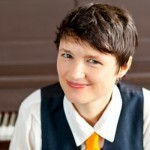 Most tracks are presented with a full band, with Ferguson most often on piano but also sometimes on guitar. 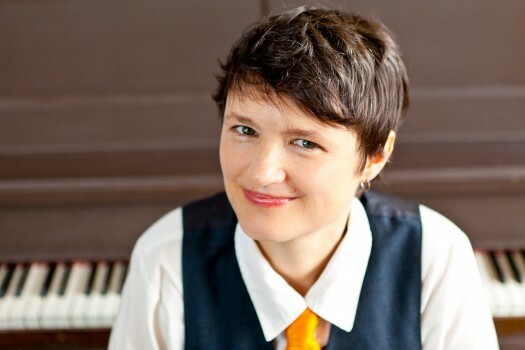 She has an impressive slate of band members and backing musicians including Jim Henry (Tracy Grammer, Mary Chapin Carpenter), Ryan Hommel (Seth Glier), and Zoe Darrow (Zoe Darrow and the the Fiddleheads). The production is very tight, with clear mixes. I appreciate that I can hear her vocals well even in the most raucous tracks. A few tracks are more simply presented, including the elegant “Grandmother’s Tree”, and the a cappella, tongue-in-cheek “Food Song”. The songs are sticking in my head which is always a good sign. Now I am eager to get her first release, Riding On The Back of the Wind, too. Listen to Carrie Ferguson, folks. you’ll have a great time! This entry was posted in reviews and tagged carrie ferguson, female singer songwriter, singer songwriter. Bookmark the permalink.